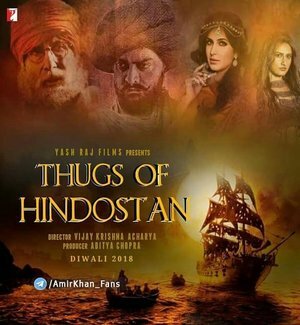 Thugs of Hindostan is an Upcoming Bollywood Film in 2018, It is Crime, Drama Film and Aamir Khan, Amitabh Bachchan in lead roles. This film is Directed by Vijay Krishna Acharya and Produced by Aditya Chopra. It is made under the banner of Yash Raj Films. Thugs of Hindostan is scheduled to release on 2018. Amitabh Bachchan, Katrina Kaif and Fatima Sana Sheikh will be seen in the lead role with Aamir in 'Thugs of India'. Significantly, Aamir Khan and Amitabh Bachchan will act together in a film for the first time. Reportedly, the film will be released in 2018. Aamir Khan Said (9 Month Ago): “Finally, the moment I’ve been waiting for has come... to work with my icon, Mr. Bachchan! Thanks Adi (Aditya Chopra), Victor, for Thugs of Hindostan. I’m too thrilled to be working with the actor I have admired all of my life. Shoot starts early next year, and the release has been locked for Diwali 2018. Can’t wait to get started! Fingers crossed,” Aamir posted on Facebook on Wednesday. Storyline:- Thugs of Hindostan movie story about of a cult group active till the 18th and 19th century. It has been heard that some exciting and big action scenes are being shot on the ships in the Thugs of Hindostan. International Crusoe has been given the responsibility to prepare ships. Amitabh Bachchan has joined the shoot which started last month.